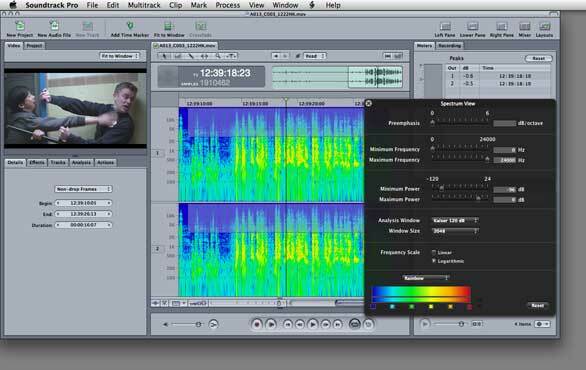 Soundtrack Pro is an audio program for video editing—it is specifically geared toward solving the kinds of problems videographers routinely encounter. With Soundtrack Pro 3, Apple continues its nice-guy approach to eschewing feature bling and focusing on real-world, day-to-day productivity improvements. Soundtrack Pro 3 does this handsomely. Features like voice level matching and advanced time-stretching algorithms let you easily address common but tricky problems in editing audio for video. In addition, new multi-track editing tools and a revised File Editor yield faster and better ways to get your audio work done. Let’s take a closer look at how these features work. Dialog levels can often get mismatched in a recorded conversation—someone is further from the microphone than they should be to capture the sound correctly, for instance. Using Soundtrack Pro’s Lift and Stamp tool, you can lift (copy) one person's audio level, and then stamp (paste) it onto other tracks—then they automatically match with no more than five clicks and keystrokes. There’s no doubt that significant hidden math is involved, but from the user's perspective, that’s all there is to it. While video editing, it is quite common to need to stretch audio to fit a clip or vice versa. Soundtrack Pro offers three different advanced algorithms to time stretch or compress audio without shifting the pitch, while at the same time giving precise feedback about what it is doing. Another nice touch, indicative of Apple's fine level of integration: third-party time stretch plug-ins are not only available, they show up in the same pop-up menu as Apple's own plug-ins. You can now record live audio tracks directly into the Multitake Editor without needing another timeline to first capture to. This is a great example of the software getting out of the way and just letting you work the way you want to work. The revised File Editor lets you edit in spectrum view—you can option-drag your cursor over a selection, even in log frequency scale, and and modify or delete just those portions of the audio spectrum in that selection. The File Editor in this version lets you drag-and-drop to add, delete, and reorder channels—a cleaner and more transparent workflow than in previous versions. In the Frequency view, you can option drag to visually select, then modify as desired just the selected audio frequencies (not just a selection based on time and duration of audio)—sort of like a Photoshop for audio. There are also a host of more subtle improvements: additional commands for trimming and extending clips; a zoom in and out control for the timeline; faster navigation; a contextual pop-up menu that shows other files related to the one selected during multiple takes of a performance; and a vastly reduced memory footprint. There is also support for iXML metadata used in field recorders for job information, and hardware support for Euphonix control surfaces. From a videographer’s standpoint, the new Soundtrack Pro 3 constitutes a worthy upgrade and is on par with the improvements throughout this version of the suite. A large number of significantly more efficient features get your work done faster and better.